As the most densely populated neighborhood in Seattle, Belltown is graciously occupied by popular restaurants, boutiques, and nightclubs that attract people from all different areas. The neighborhood of Belltown is located on the city’s downtown waterfront on land that was artificially flattened from what used to be a steep hill. The area also now contains residential towers, warehouses, art galleries and is home to the Art Institute of Seattle, as well as a few other universities and colleges. In 2007, CNNMoney named Belltown as the best place to retire in the Seattle area saying that it is a “walkable neighborhood with everything you need”. Previously home to Alaska Airline headquarters, Belltown is surrounded by Denny Way to the north, Elliot Bay to the southwest, and by 5th Avenue to the northeast. The neighborhood also features the Battery Street Tunnel that runs from Western Ave to Denny Way and connects Alaskan Airway Viaduct to Aurora Avenue. One other great component of the Belltown neighborhood is the Olympic Sculpture Park which is made up of 8.5 acres of contemporary pieces, various plants and ecosystems primitive to the Pacific Northwest. It is available to the public 365 days a year and opens 30 minutes before sunrise and closes 30 minutes after the sun sets. 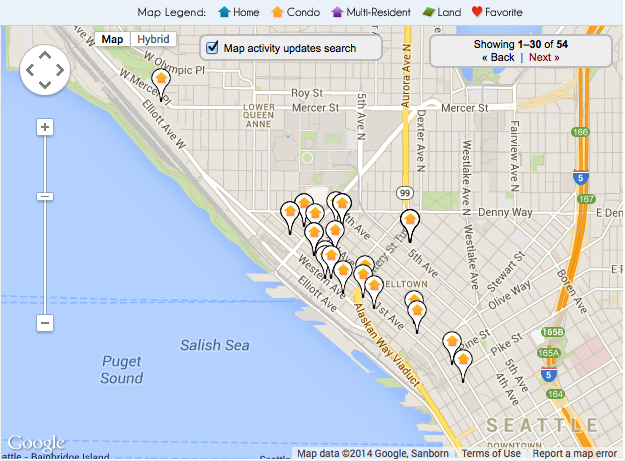 One cannot go wrong when considering purchasing real estate in Belltown. The area has many modern homes that present alluring views of the Seattle skyline and Elliot Bay. There are also plentiful condos for sale in Belltown that offer proximity to desirable amenities such as restaurants, retail shops, and of course, the waterfront. Belltown condos generally contain countless features that ensure a comfortable lifestyle, such as indoor pools, fitness areas and sometimes even a complete 24-hour concierge. Within the condos, it can usually be expected that there will be natural light streaming in through the windows, along with complete water and city views that never get old. Whether you’re looking for a reasonably priced condo or willing to spend a good amount for one, there are endless options available in the densely populated neighborhood of Belltown. The majority of the condos offer breathtaking scenic views through their floor-to-ceiling glass frames, showing off the waters of the Puget Sound, as well as prominent mountains and city lights. Many of the condos throughout the area were designed with just one or two bedrooms, but offer amenities like restored chef’s kitchens, spacious storage area, hardwood floors, granite counter-tops, gas fireplaces and more. They often contain a spacious layout, some with lots of undeveloped space just waiting for someone to get started, and some that are already set with their large decks and private terraces. The new Insignia Condominiums will be the largest condo complex within Seattle once they are officially completed, which is said to be the end of 2014 or in early 2015. These $450 twin tower condos have a total of 707 units amongst their 41 floors and contain amenities such as: concierge, courtyards, a pool, a library and much more. For those interested in spending a pretty penny, then one of these condo units would be right up your alley.